Situated directly across from the Dover Air Force Base, this Delaware hotel offers comfort and convenience at a reasonable rate. Experience the highest quality of customer service, comfort and convenience while staying at the Best Western Galaxy Inn. 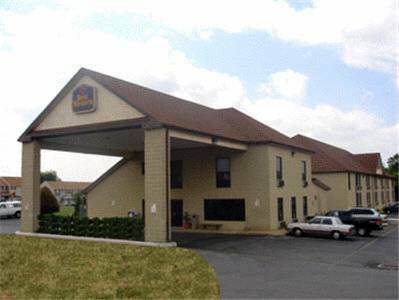 Located right across from the Dover Air Force Base in Delaware, this Dover hotel is situated in the quiet southern end of town while still providing convenient access to many local attractions. Hotel guests will find themselves minutes away from historic downtown Dover and the Dover Downs Racetrack and Casino. The Best Western Galaxy Inn offers 63 well-appointed guest rooms, each featuring a single serve coffee maker, microwave, refrigerator, iron and board, cable television and free high-speed internet access. Enjoy a complimentary continental breakfast with a hot bar each morning to start off the day. The hotel also features a fitness room, outdoor seasonal swimming pool, guest laundry and some business services. **Please note, the hotel apologizes we do not have an elevator on property** Just minutes from the hotel, guests can take a tour of the State Capitol or of Dover Air Force Base, home of the "C-5 Galaxy" cargo transport aircrafts. Enjoy bay area fishing or lying on the beach at Rehoboth or Dewey Beach. Hotel guests will also be close to a variety of local shopping. Guests traveling on business will appreciate the hotel's close proximity to corporate locations such as the State and County Offices, Kraft Foods Inc. and Playtex Products Inc. Both Delaware State University and Wesley College are also located nearby. Make a reservation today and save at the Best Western Galaxy Inn! Enjoy your stay. From: Delaware Route 1 south Take Exit 95, and follow signs for Route 10 West Lebanon Rd. At Rt 10 West Lebanon Rd. Turn right go under the overpass and the hotel is on the left. The Best Western Galaxy Inn. From: Delaware Route 1 north Take exit 95 for Route 10 Lebanon Rd. Turn left on Rt 10 west lebanon rd. Go under the overpass and the hotel is on the left. The Best Western Galaxy Inn. From: US Highway 13 Turn east on Rt.10 which is Lebanon Rd. Travel 4 lights and hotel in located on the right. Kraft Foods Inc.5 mile(s) from Kraft Foods Inc.
Dover Downs Casino, Racetrack,6 mile(s) from Dover Downs Casino, Racetrack, & Conf. Ctr.